Hay House Inc., 9781401952358, 224pp. In today’s work environment, the lines between our professional and personal lives are blurred more than ever before. Whatever is happening to us outside of our workplace—whether stressful, painful, or joyful—follows us into work as well. We may think we have to keep these realities under wraps and act as if we "have it all together." But as Mike Robbins explains, we can work better, lead better, and be more engaged and fulfilled if—instead of trying to hide who we are—we show up fully and authentically.Mike, a sought-after motivational speaker and business consultant, has spent more than 15 years researching, writing, and speaking about essential human experiences and high performance in the workplace. His clients have ranged from Google to Citibank, from the U.S. Department of Labor to the San Francisco Giants. From small start-ups in Silicon Valley to family-owned businesses in the Midwest. From what he’s seen and studied over the years, Mike believes that for us to thrive professionally, we must be willing to bring our whole selves to the work that we do.Bringing our whole selves to work means acknowledging that we’re all vulnerable, imperfect human beings doing the best we can. It means having the courage to take risks, speak up, have compassion, ask for help, connect with others in a genuine way, and allow ourselves to be truly seen. In this book, Mike outlines five principles we can use to approach our own work in this spirit of openness and humanity, and to help the people we work with feel safe enough to do the same, so that the teams and organizations we’re a part of can truly succeed. "This book will offer you insights, ideas, and tools to inspire you to bring all of who you are to the work that you do—regardless of where you work, what kind of work you do, and with whom you do it. And, if you’re an owner, leader, or just someone who wants to have influence on those around you—this book will also give you specific techniques for how to build or enhance your team’s culture in such a way that encourages others to bring all of who they are to work." "Bring Your Whole Self to Work is a great book for leaders, teams, and companies that are interested in collaboration, trust, and high performance. Mike has a great style and unique perspective. The principles in this book have helped me and our executive leadership team at eBay." "To make the greatest impact in the world, we must first start within. The lessons outlined in Bring Your Whole Self to Work will help you unlock and unleash your most authentic, vulnerable self. Excellent advice for anyone in business—from CEO to aspiring entrepreneur." "Bring Your Whole Self to Work is full of practical tools for learning how to be present and live more fully . . . and, by doing so, to be stronger performers, better team players, more effective leaders, and happier people. Thank you, Mike, for making a great case for truly showing up at work and giving us tangible suggestions for how to do so." "If you want to take your career to the next level and have impact on those around you, as well as the culture of your team, Bring Your Whole Self to Work is for you. This book is filled with wisdom and tangible ideas that you can put into practice right away." 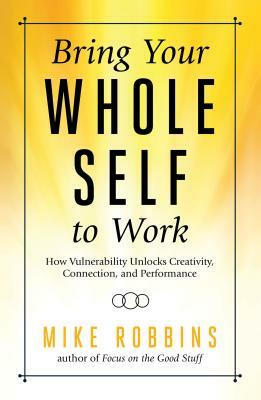 "In Bring Your Whole Self to Work, Mike Robbins teaches us that by revealing our imperfect, authentic selves at work, we give those around us permission to do the same, and the result is a more confident, compassionate, collaborative, and engaged work environment for all. Writing with his signature wisdom, candor, and care, Mike proves that work is like all our most important relationships: our experience and outcome is transformed when we stop pretending to be who we think we should be, and start showing up as who we really are." "Mike Robbins is an important thought leader for our times. He reminds us simultaneously to embrace and celebrate our diversity, and that we’re way more alike than we are different. The ideas in Bring Your Whole Self to Workare fundamental to the success of leaders and teams in all aspects of our society today. This book could not have come at a better time." "This book reminds us that leadership is about service, caring about the people we work with, and building strong teams. I’ve had the pleasure of working with Mike Robbins and I appreciate his commitment to these important principles. Bring Your Whole Self to Workwill help you enhance your capacity and impact as a leader, and as a human being." "Bringing our whole selves to work is about being radically candid and connecting with the humanity of those around us. Mike Robbins does a great job of laying out why this is important to our success and how to do it in this powerful book." "As a CEO and little league coach, I’ve come to see shared purpose as the best predictor of group performance. Encouraging vulnerability and connection across your team is an unlock for both. Bring Your Whole Self to Work is a powerful guide to this type of leadership and culture." "This book is a powerful tool. The world is calling for us to step up, speak up, and bring all of ourselves to the work we do. Mike Robbins challenges us to do this in an inspiring way." "Mike Robbins is a trusted advisor to us, and has had a very positive impact on me personally, as well as on our leaders and the corporate culture at Nutanix. The ideas and principles in Bring Your Whole Self to Work are critical to teams that want to thrive in today’s competitive business environment." "Mike Robbins has a unique knack for connecting personal fulfillment to business success. His important lessons of appreciation, authenticity, and empathy are universal and lead to more engaged employees. Not only do I use some of his exercises with our organization, but I even suggested one that my daughter’s teacher used in class." "I have witnessed the power of the principles in this book. I have seen how authentic and vulnerable leaders and teams come together and perform at a higher level and even win championships. Mike Robbins gives you the blueprint to lead and work more powerfully in this significant, pioneering, and must-read book." "The principles in Mike Robbins’ Bring Your Whole Self to Work are important learnings, especially in today’s complex business environment. Creating cultures of diverse and engaged employees is the secret to serving customers in a standout way that allows organizations to thrive, and employees to innovate and do their best work." "We hear words like integrity, authenticity, and empathy kicked around these days. But what are they really? And, how do they play into our quest to contribute meaningfully to the world and to live a good life? In Bring Your Whole Self to Work, Mike Robbins digs into these questions, invites us to live more integrated lives and bring more of our true selves to work, so we can have the biggest impact on those around us and the world."